Topaz is a silicate mineral of aluminum and fluorine, with the chemical formula Al2SiO4(F,OH)2. Typically, its crystals are wine or straw-yellow in color, but they can also come in a variety of other colors, including green, blue, pink, gray, or white. The stones are mainly used as gems in jewelry. The biggest topaz crystal ever found, named "El Dorado," was found in Brazil in 1984. It weighs 6.2 kilograms and belongs to the British Royal Collection. 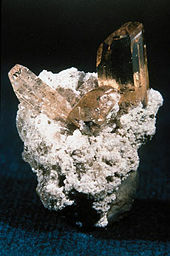 Topaz crystallizes in the orthorhombic system and its crystals are mostly prismatic terminated by pyramidal and other faces, the basal pinacoid often being present. It has an easy and perfect basal cleavage, meaning that gemstones or other fine specimens have to be handled with care to avoid developing cleavage flaws. The fracture is conchoidal to uneven. Topaz has a hardness of 8 on the Mohs scale, a specific gravity of 3.4-3.6, and a vitreous luster. Pure topaz is transparent but it is usually tinted by impurities that give it a variety of colors and may make it translucent. The colors include wine or straw-yellow, white, gray, green, blue, pink or reddish-yellow. When heated, yellow topaz often becomes reddish-pink. The stone can also be irradiated, giving it a light and distinctive shade of blue. A recent trend in jewelry is the manufacture of topaz specimens that display iridescent colors, by applying a thin layer of titanium oxide via physical vapor deposition. 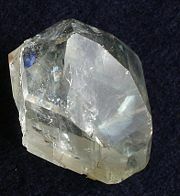 According to Rebbenu Bachya, the word "Leshem" in the verse Exodus 28:19 means "Topaz" and was the stone on the Ephod representing the tribe of Dan. Yellow topaz is the traditional November birthstone. ↑ A famous gemstone created by physical vapor deposition is called "Mystic Fire Topaz." Azotic Coatings patented this name in 1998. Retrieved March 23, 2007. Gem by Gem: Topaz. International Colored Gemstone Association. This page was last modified on 11 December 2015, at 17:18.